The orbit of S0-2 (light blue) located near the Milky Way's supermassive black hole will be used to test Einstein's Theory of General Relativity and generate potentially new gravitational models. Maunakea, Hawaii– Astronomers have the “all-clear” for an exciting test of Einstein’s Theory of General Relativity, thanks to a new discovery about S0-2’s star status. But in a study published recently in The Astrophysical Journal, a team of astronomers led by a UCLA scientist from Hawaii has found that S0-2 does not have a significant other after all, or at least one that is massive enough to get in the way of critical measurements that astronomers need to test Einstein’s theory. The researchers made their discovery by obtaining spectroscopic measurements of S0-2 using W. M. Keck Observatory’s OH-Suppressing Infrared Imaging Spectrograph (OSIRIS) and Laser Guide Star Adaptive Optics. CREDIT: D. CHU Lead author Devin Chu of Hilo, Hawaii is an astronomy graduate student at UCLA. 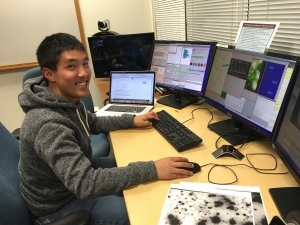 The Hilo High School and 2014 Dartmouth College alumnus conducts his research with the UCLA Galactic Center Group, which uses the W. M. Keck Observatory on Hawaii Island to obtain scientific data. "Growing up on Hawaii Island, it feels surreal doing important research with telescopes on my home island. I find it so rewarding to be able to return home to conduct observations," Chu said. 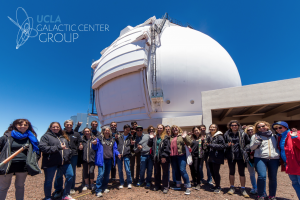 CREDIT: UCLA GALACTIC CENTER GROUP The UCLA Galactic Center Group takes a photo together during a visit to Keck Observatory, located atop Maunakea, Hawaii. Members of the group will return to the Observatory this spring to begin observations of S0-2 as the star travels towards its closest distance to the Galactic Center's supermassive black hole. Einstein’s Theory of General Relativity predicts that light coming from a strong gravitational field gets stretched out, or “redshifted.” Researchers expect to directly measure this phenomenon beginning in the spring as S0-2 makes its closest approach to the supermassive black hole at the center of our Milky Way galaxy. This will allow the Galactic Center Group to witness the star being pulled at maximum gravitational strength – a point where any deviation to Einstein’s theory is expected to be the greatest. The study also sheds more light on the strange birth of S0-2 and its stellar neighbors in the S-Star Cluster. The fact that these stars exist so close to the supermassive black hole is unusual because they are so young; how they could’ve formed in such a hostile environment is a mystery. “Star formation at the Galactic Center is difficult because the brute strength of tidal forces from the black hole can tear gas clouds apart before they can collapse and form stars,” said Do. There are several theories that provide a possible explanation, with S0-2 being a binary as one of them. “We were able to put an upper limit on the mass of a companion star for S0-2,” said Chu. This new constraint brings astronomers closer to understanding this unusual object. “Stars as massive as S0-2 almost always have a binary companion. We are lucky that having no companion makes the measurements of general relativistic effects easier, but it also deepens the mystery of this star,” said Do. W. M. Keck Observatory is a distinguished leader in the field of adaptive optics (AO), a breakthrough technology that removes the distortions caused by the turbulence in the Earth’s atmosphere. Keck Observatory pioneered the astronomical use of both natural guide star (NGS) and laser guide star adaptive optics (LGS AO) and current systems now deliver images three to four times sharper than the Hubble Space Telescope. AO has imaged the four massive planets orbiting the star HR8799, measured the mass of the giant black hole at the center of our Milky Way Galaxy, discovered new supernovae in distant galaxies, and identified the specific stars that were their progenitors. Support for this technology was generously provided by the Gordon and Betty Moore Foundation, W. M. Keck Foundation, the National Science Foundation, and other Friends of Keck including The Bob and Renee Parsons Foundation, Change Happens Foundation, Mt. Cuba Astronomical Foundation, and Sanford and Jeanne Robertson. A team of astronomers led by Devin Chu, a UCLA scientist from Hawaii, has found that S0-2 does not have a significant other after all, or at least one that is massive enough to get in the way of critical measurements that astronomers need to test Einstein’s Theory of General Relativity. Up until now, it was thought that S0-2 may be a binary, a system where two stars circle around each other. Having such a partner would have complicated the upcoming gravity test.